I started this blog in 2008 and have posted approximately 800 times with what I try to make content-rich and often new and original material, mixed with my own opinions. This has brought the blog about 300,000 page views. It is a drop in the bucket to some of viral Youtube hits, but still not bad for a blog on a topic few were interested in when I started tracking Jewish monuments 25 years ago. Today, it would be a full time job - or more - just to track all the information and pictures that are posted about Jewish heritage sites, let alone analyze them for importance or do any new research. Websites like Jewish-Heritage-Europe.eu are doing a great job collating news from Europe and disseminating in various media (including Facebook). Jewish-Heritage-Europe.eu was the organizing force behind the conference this past April on Managing Jewish Immovable Property held in Krakow and now fully available on vide via the wedsite. The blog Point of No Return, which focuses mostly on the exile and diaspora of Jews from Muslim lands (with a moral and political agenda) also includes much valuable information about this history and present plight of Jewish monuments and sites in the Mizrachi World. Surprisingly, there is still no similar mechanism for collecting and posting American news, most of which remains unreported. Here are some links to some new additions in ever-expanding Jewish monuments cyberspace that might interest my readers. They have much to offer - but as always when using web-based sources, caveat lector. 1. 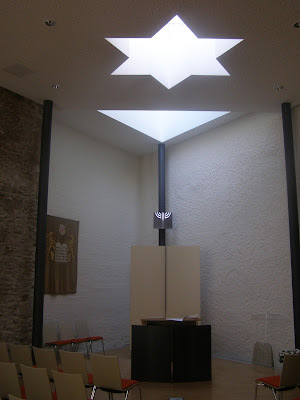 I've long been a big admirer of Louis Davidson's website synagogues360.org. This summer I had the pleasure to meet Louis when he and his wife came to Syracuse to photograph two architecturally significant synagogues here. Louis has now started a blog about his work that includes history, methodology, adventure and personal observations on the many synagogues he visits and photographs every year. Louis - welcome to the blogosphere! You can follow Louis Davidson here. 2. West Virginia-based synagogue maven Julian H. Priesler has been collecting information about American synagogues for years (decades?). His massive grab-bag compilation of synagogue images is still the most comprehensive and useful starting point to learn the geographic and architectural variety of the American synagogue experience. 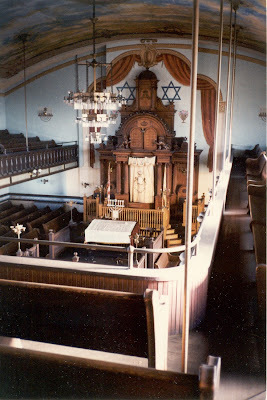 Julian recently published an Arcadia photo-history Jewish West Virginia and he has been working more intensively documenting the scores of former and present synagogues in Pennsylvania. Julian regularly posts information and photos from his search on Facebook. 3. For something further afield, you can see scores of images of Romanian synagogues (collected from various sources) at the Facebook page Romanian Endangered Synagogues. I usually do not promote anonymous websites; I think people should take responsibility for what they write and post. I don't know who maintains this site. The initiators from Alexandria, Virginia do not announce themselves, merely stating the "Romanian endangered synagogues is an initiative of a small group of individuals interested in the rehabilitation and preservation of the Romanian Synagogues." The group tends not to source or date their information or credit their photos - a common abuse on Facebook, Tumbler and other social media sites, including occasionally - though inadvertently - my own). Still, the plight of Romanian synagogues is very real - and exists for a variety of reasons - and getting out images of these many stately and often beautiful buildings is a good thing. I hope it will prick the Jewish consciousness and stir some action. The Jewish world needs to turn the spotlight on this largely forgotten legacy to insure the protection and survival of scores hundreds of important synagogues and cemeteries. Every little bit helps. I'll be writing more about Romanian synagogues in the coming months. Do have other blogs, pages or other sources you'd like to recommend? Send me your links. Braunschweig, Germany. 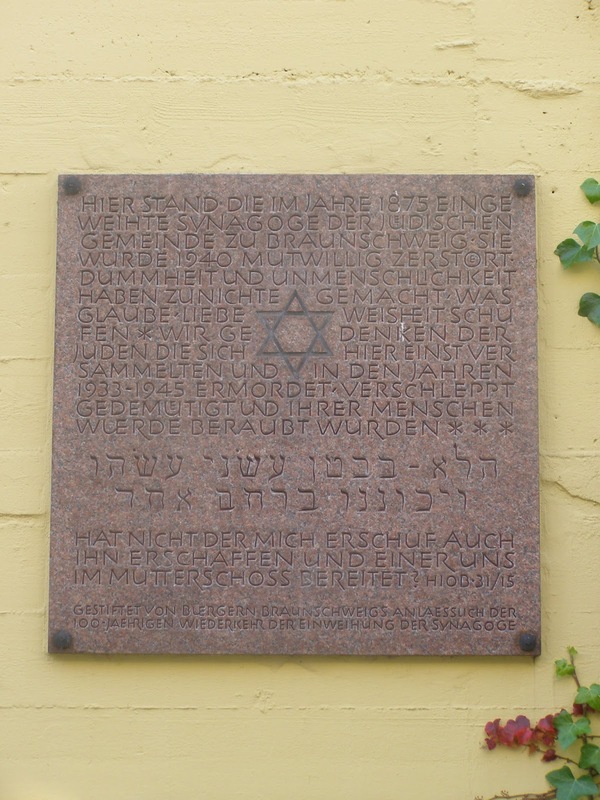 Commemorative plaque installed on site of destroyed Neue Synagoge in 1975 on the 100th anniversary of the synagogue's 1875 dedication. Photo: Samuel D. Gruber 2007. Bet Tfila – Research Unit for Jewish Architecture in Europe at the Technische Universität Braunschweig and the Center for Jewish Art, Hebrew University of Jerusalem are organizing an important conference in Germany next spring about "Jewish Architecture" with a special emphasis on preservation of historic buildings and sites. In many ways this a follow-up to highly successful conference "Jewish Architecture in Europe" held in Braunschweig in 2007. It will also inevitably be a follow-up to the Krakow conference Managing Jewish Immovable Heritage of this past April, though with more of a scholarly than an activist agenda. The conference will only go forward if funding is secured, but a call for papers is posted here. Braunschweig, Germany. New synagogue. Photo: Samuel D. Gruber 2007. Braunschweig, Germany. 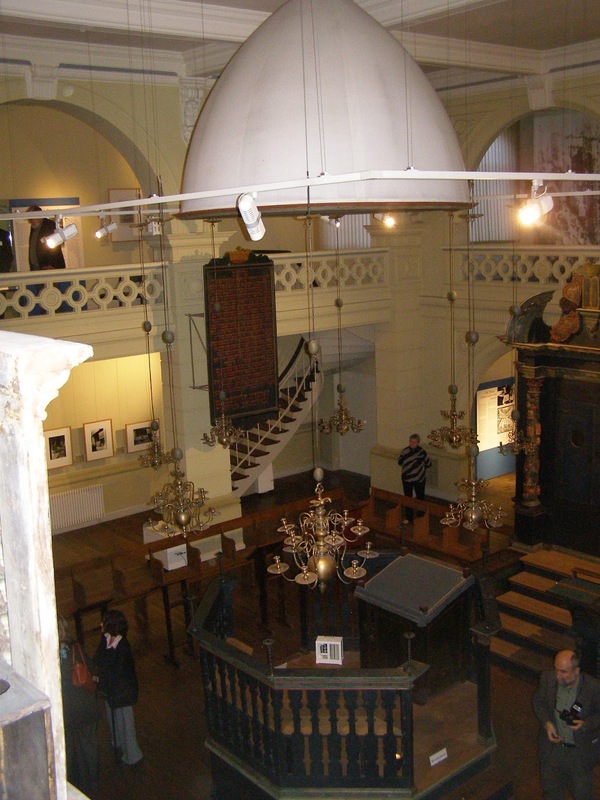 Jewish Museum with Ark and bimah from Hornburg Synagogue. Photo: Samuel D. Gruber 2007. Jewish sacred and secular buildings have been part of the architecture and cityscapes since antiquity; the earliest findings of Jewish settlements and buildings in northern Europe date back to medieval times. During the course of the centuries, a broad range of structures that are essential for Jewish congregational life were constructed: synagogues, mikva’ot, cemeteries, Taharah houses, kosher slaughterhouses, bakeries, etc. The turn from the 19th to the 20th centuries marks the biggest growth of Jewish life in Europe that underwent a fundamental break during the Nazi era. The current generation, like its successors, too, is confronted with the appropriate treatment of the remains, that former Jewish communities inherited. Besides the numerous written and visual sources, the preserved former Jewish buildings themselves call for response to their substance. The Bet Tfila – Research Unit for Jewish Architecture in Europe organizes the interdisciplinary and international conference Jewish Architecture – New Sources and Approaches in order to discuss the effective and upcoming handling of “Jewish architecture” as part of the Jewish visual heritage. The conference will take place at the TU Braunschweig (Germany). On basis of primary sources and case studies, the tangible evidences of Jewish architecture in Germany and Europe will be revealed, analyzed, and put into contrast with the generic European architecture. Focus will be given to the tangible evidence itself and the inherent scope of its possible interpretations. Current activities reveal the utmost urgency of this discussion, in which scholars of various scientific disciplines will present the state of their research as well as new working techniques and methods. Furthermore, trendsetting perspectives for aims and tasks in future research will be developed. The conference will emphasize the documentation and preservation of Jewish monuments and sights as well as their integration and transformation into museums. The conference’s official language will be English. The lectures shall not exceed 20 minutes. The conference will only take place if the necessary funds are granted. In this case, we will reimburse parts of travel expenses for lecturers. Please send a short abstract (max. 1 page) with additional CV by Monday, October 21, 2013, to info@bet-tfila.org. 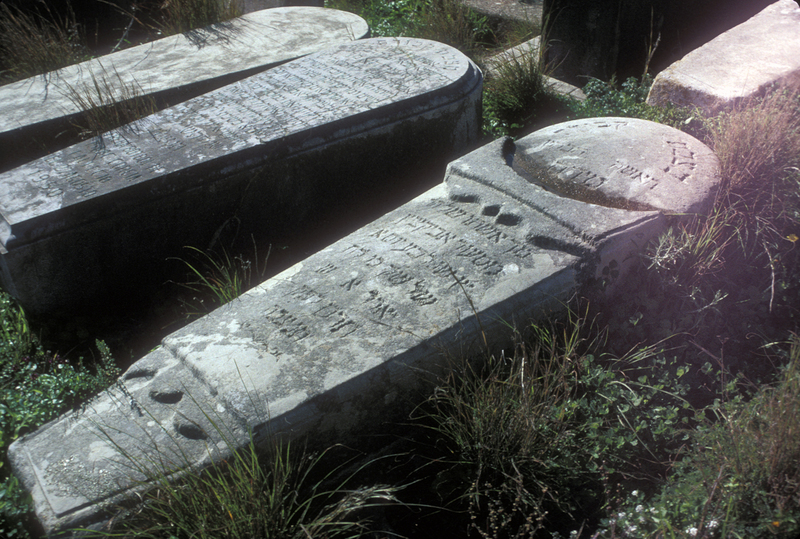 (ISJM) The JTA relays a report from the French daily Sud Ouest that the French municipality of Bidache, not far from the Sephardi center of Bayonne in the far south-east corner of France, has begun renovating an ancient Sephardi cemetery. The restoration of the 17th-century cemetery began last week. The first work, funded with an $8,000 allocation from the regional cultural affairs directorate of the Pyrenees-Atlantiques region will focus on a large arch built on the premises. The restoration is being led by the Jewish Liturgical Organization in cooperation with architect Soizic Le Goff, who received the go-ahead from local authorities in June. Sephardi Jews who fled from Portugal and Spain settled in the area with permission from the princes who ruled Gramont and an independent principality from 1570 until the French Revolution. Thus French laws excluding Jews were not in effect in the borderland. A local researcher says that members of at least 40 Jewish families are buried in the cemetery. In the 1960s Gérard Nahon recorded 62 inscriptions from the cemetery in Inscriptions funéraires hébraïques et juives à Bidache, Labastide-Clairence (B. Pyr.) et Peyrehorade (Landes)(1968), including the family names Dacosta, Henriquez Lopez Nunez, Depas and Alvares. 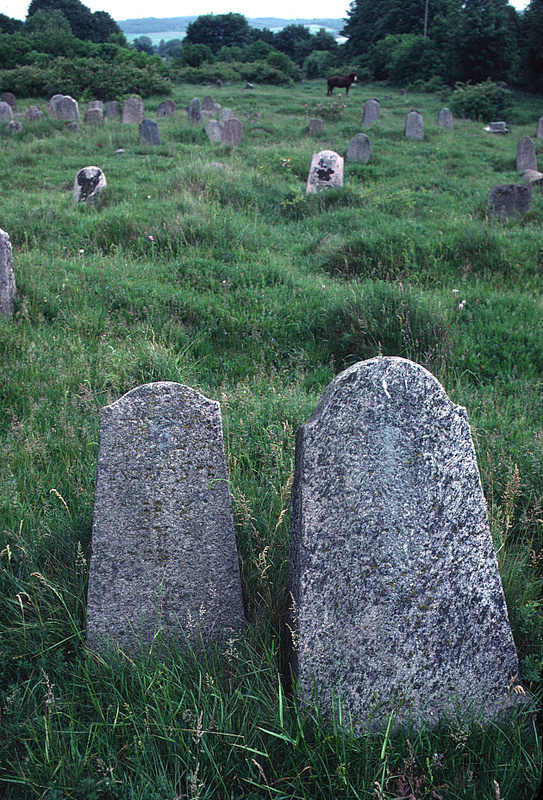 A photo of the cemetery shows several dozen large flat gravestones lined in even rows typical of Sephardi burials elsewhere in Europe (Amsterdam, Venice). 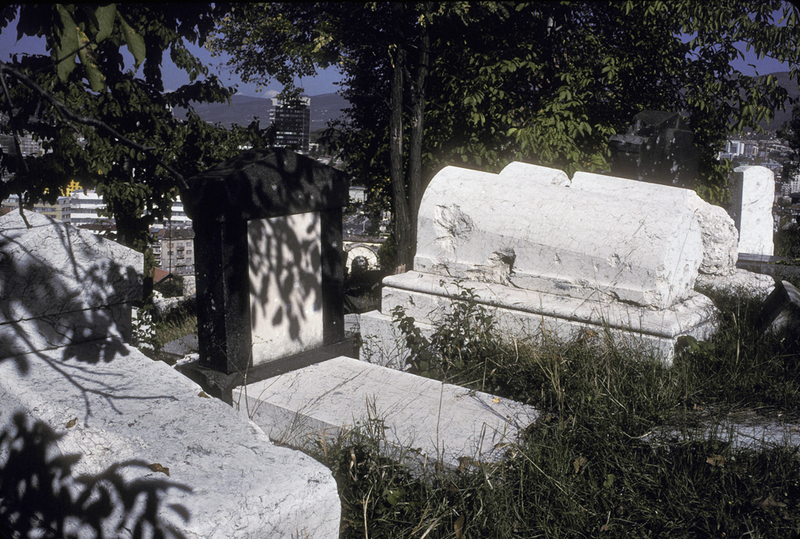 It is not clear if these are in their original locations atop burials or if they have been arranged as a sort of lapidarium (as has been done in other old cemeteries). At least some inscriptions are bi-lingual in Hebrew with Roman lettered abbreviations - either in Spanish or Portuguese. According to the website of the French Ministry of Culture the cemetery site includes "enclosures with ruined wall and entrance gate arc full-handlebar unit of limestone. The cemetery was used from the second half of the 17th century to the second half of the 18th century, of the dispersion of the Jewish community of Bidache. The cemetery contains hundreds of graves. The inscriptions, which generally include anything else that the name and surname of the deceased and the date of their death, ranged between the 3rd quarter 17th century and 4th quarter 18th century." To read more about the Jews of Bidache see the article (in French) by Gérard Nahon, "Le registre espagnol des circoncisions de Samuel Gomes Atias (Bidache 1725-1773)", Bulletin Hispanique, 1974, Volume 76: 1-2, pp. 142-182, online here. A new format at the Association of Jewish Studies Annual Meeting (Boston, Dec 15-17, 2013) will allow in-depth multi-day scholarly seminars around topics instead of the traditional panels of read papers. I am excited to be participating along with scholars I admire greatly in a three day seminar on the theme "The Practice and Materiality of Jewish Death." I'll be speaking on the topic “History, science and religious politics: The archaeology of medieval Jewish cemeteries” about what sometimes refer to as "The Science of Desecration" - the history of excavation of Jewish cemeteries in Europe since the 19th century and the the thin and highly contested line between science and desecration (you can read the abstract below). Here is the accepted abstract and program for the seminars. Papers will be submitted, circulated and (hopefully) read beforehand, and more in depth discussion can take place. Jewish beliefs surrounding death, the afterlife and the end of times have been a topic of significant study across the discipline and in all periods of Jewish history. On the other hand, the human practices and material culture in which Jewish conceptions of death have been ritualized have received only sporadic and uneven attention. The papers contributed to “The Practice and Materiality of Jewish Death” will explore the roles that material culture and ritual practice plays in the Jewish experience of death, mourning and remembrance, and in the social construction of Jewish belief and custom. From tombstones and the tearing of garments to food and fasting, the papers included in this seminar will deal with specific aspects of Jewish funerary customs, ancient, medieval or modern. The three-day seminar will be divided topically around discussion of three themes: “Ritual and Performance,” “Politics and Identity,” and “Communities and Contexts”. The papers of the first session, “Ritual and Performance” (Todd, Labovitz, Goldberg, Sion), investigate the different rituals and practices performed by Jewish communities across time, and the role these customs play in Jewish responses to death and mourning. The papers of the second session, “Politics and Identity” (Russo, Olson, Rosenthal, Gruber), examine the connection between funerary culture and issues of power, politics and identity. The final session, “Communities and Contexts” (Zissu, Burrus, Fine, Malkiel), considers various aspects of Jewish communities as represented in funerary culture, including social class and regional influences. This paper will first present the archaeological evidence for Jewish funerary meals from Roman period Galilee , before discussing the significance of these meal practices within the context of Greco-Roman dining culture. This paper will explore particularly the activities which the tannaitic authors imagine women to undertake as part of the funeral process, using mMo’ed Qatan 3:8-9 as a point of entry. Integrating biblical, rabbinic, Greco-Roman, and Christian materials, questions to considered here include: was public mourning a professional role for rabbinic women, what was the nature of women’s activities and laments at funerals, did the forms of lament and praise for the deceased offered at the funeral differ (materially and/or in terms of their social valuation) if offered by men or by women, why might these roles have been assigned especially to women. The Treatise Semahot (3rd century) shows that during the Antiquity, death and all that surrounds it were subjected to special ceremonials: professional mourners, weeping, elegies, first burial and second-burial are displaying a spectacular image of death. However, this staging of death has undergone many changes over time. As it is well known that many rituals, customs, and prayers were introduced during the Middle-Ages, this paper will therefore seek to focus on some of them selected on the basis of their material aspects, containing concrete representation of the approaches of death in the Jewish world at that time. 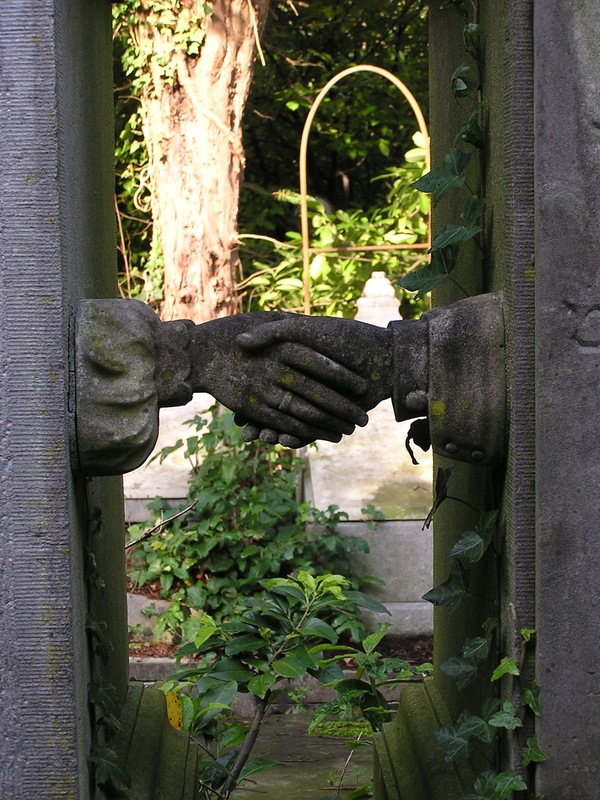 How do Jews perform funerary and commemorative rituals in the absence of bodily remains? The Holocaust, the Argentine dictatorship and the September 11, 2001 attacks offer metonymic, symbolic, and surrogate responses to the missing corpses. Kryinki, Poland. Jewish cemetery. Photo: Samuel D. Gruber, 1990. "Marginal or Monumental? 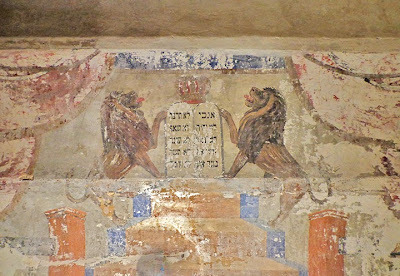 Kokhim in the Catacombs of Rome Jessica Dello Russo (Northeastern University)"
This contribution to the AJS seminar on "The Materiality of Jewish Death" examines the arrangement of multiple examples of the distinctive tomb type known as the "kokh" (pl. "kokhim") within certain areas of the catacomb of the Vigna Randanini in Rome, drawing attention to their unusual characteristics and organization in this particular site in light of their limited presence in the other catacombs in Rome and most other cemeteries outside of Palestine in the period of Late Antiquity. The most ubiquitous -- and historically useful -- pieces of material culture surrounding death in Jewish cultural history is the matsevah, the tombstone. For the most part, historians have approached these often complex works of sculpture in the modern period primarily as conveyances of demographic information, but the design of Jewish matsevot in the 19th and 20th centuries provides valuable, and unique insight into the evolving tastes and cultural identities of central European Jews. This paper will examine and interpret the evolution of these monuments in the context of evolving Jewish identity in Germany and Austria-Hungary between 1848 and 1914. The growth of the urban Jewish population of Poland after the First World War strained existing cemetery infrastructure to such an extent that communities were forced to reorganize how burial space was allocated and defined. These changes to the use of space in sanctified burials grounds indicate how Jewish officials navigated their dual responsibilities to their poor constituency and to the new governmental bodies of the Second Polish Republic. The 19th-century rediscovery and excavation of the Rue de la Harpe Jewish cemetery in Paris and the Jewish catacombs in Rome alerted and excited historians about the potential rewards of the archeology of European Jewish sites, including cemeteries, but for the most part little conscious effort was made to identify the locations or to methodically examine the remains of Jewish cemeteries until the 1980s, when again, like in 19th-century Paris, new urban development encroached on previously undisturbed burial grounds. This paper and discussion will examine recent methods of and finds from Jewish cemetery excavations in England, Spain, the Czech Republic and elsewhere, and how new discoveries have been greeted with enthusiasm and opposition by different quarters of the academic and religious Jewish communities. Brussels, Belgium. Jewish Cemetery. Photo:Samuel D. Gruber 2005. While the urban necropolis of Jerusalem during the late Second Temple period (2nd c. BCE-1st c. CE) has been thoroughly studied, the more distant Jewish rural areas have been mostly neglected. The proposed paper attempts to present an overview of the tombs' architecture, burial customs and chronology of Jewish burial in the Judean countryside vs. those of the urban center of Jerusalem during the 2nd c. BCE - 2nd c. CE. The catacombs at Beit Shearim (ca. 200-400 CE) offer a chance to explore how disparate communities, the local Galilean and the diasporic, come together in the same funerary sphere. This paper will examine the role of visual culture in the Beit Shearim catacombs as a point of demarcation between communities. This paper explores the ways that ancient rabbis constructed their own vision of the biblical Tomb of the Patriarchs in Hebron. It suggests that the rabbis imagined the tomb complex in ways that reflect monumental communal burial complexes of late antiquity, most notably those at Beit She'arim in the lower Galilee. It further argues that the rabbis project burial practices and attitudes toward the dead of their own time onto the Tomb of Machpelah. The art of a small set of Hebrew tombstones from Padua reveals the complex interplay of Jewish literary sources and carved images, which perforce required Jewish participation in the tombstone’s design, if not its execution. These sophisticated creations were clearly the work of the city’s Jewish intellectuals, which raises the question of the accessibility of both text and icon to the general Jewish population. 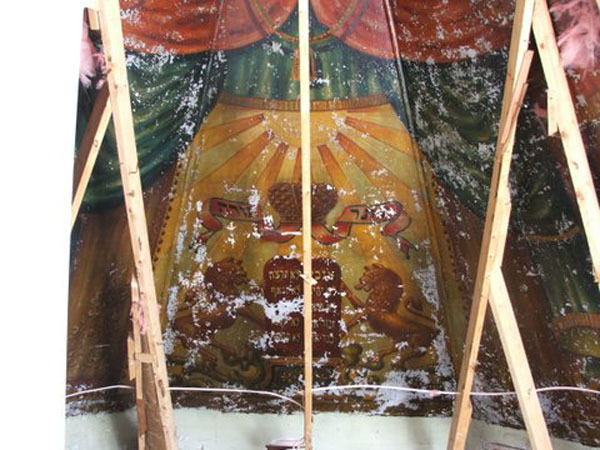 (ISJM) After almost three years of discussion and organization, plans are getting underway for the recovery and restoration of a rare surviving synagogue mural painted in 1910 by a Lithuanian Jewish immigrant artist Ben Zion Black for the East European Orthodox Chai Adam congregation in Burlington, Vermont. 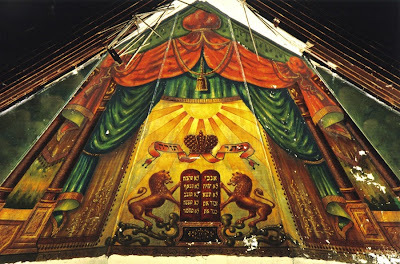 The mural, seen above, depicts the Decalogue (Ten Commandments) flanked by rampant lions and surmounted by a floating crown, all bathed with the rays of the sun, and framed by architectural elements and elaborate curtains. More photos can be seen here. You can contribute online or by check to the costs of conservation and preservation here. Every contribution - no matter what size - helps the project directly and to secure matching funds. This work is a survivor, a rare painting; one of only a small number of extant "East European" synagogue murals in this country. I am hesitant to call this work "folk art," though it is often described as such. Black, the Burlington painter who had emigrated from Kovno, Lithuania, was a trained professional, with a knowledge of perspective and tromp l'oeil. In Europe and American such painters found much work in religious buildings, but also decorating theaters, restaurants and other public venues. Read the artist's biography here. The presence of the mural has been known to a few specialists (such as artist and Jewish folk art researcher Murray Zimiles), but the painting was never published. 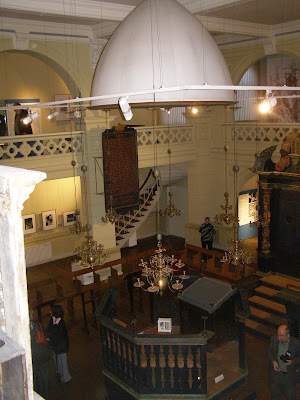 The Chai Adam Synagogue operated from 1889-1939 when it merged with Ohavi Zedek Synagogue, and the mural was entirely lost to view in 1986, when it was covered when the building was converted into an apartment building. Originally, there were other associated symbols further down the wall on both sides of the Ark, including musical instruments illustrating the 150th Psalm. These are visible in an old photograph, but were not visible in 1986, when photos were taken before the conversion to apartments. Burlington, Vermont. Former Chai Adam congregation, detail of mural in 1986. Photo: courtesy of Congregration Ohavi Zedek. In 2010 a committee from Burlington's Ohavi Zedek Synagogue was able to briefly open the wall concealing the mural to view the status of the mural which though deteriorated, was largely intact. Efforts to extract the mural began and last year, it was fully revealed by the building's owner, Offenhartz Inc., who has offered to donate the mural to Ohavi Zedek, whose congregation has now taken on the challenging task of conserving the mural and moving it to an accessible home. It is an expensive undertaking and the congregation has begun a international fund raising campaign to assist saving this rare example of Lithuanian-American Jewish synagogue art. Burlington, Vermont. Former Chai Adam congregation, detail of mural as recently revealed, showing deterioration. Photo: courtesy of Congregration Ohavi Zedek. 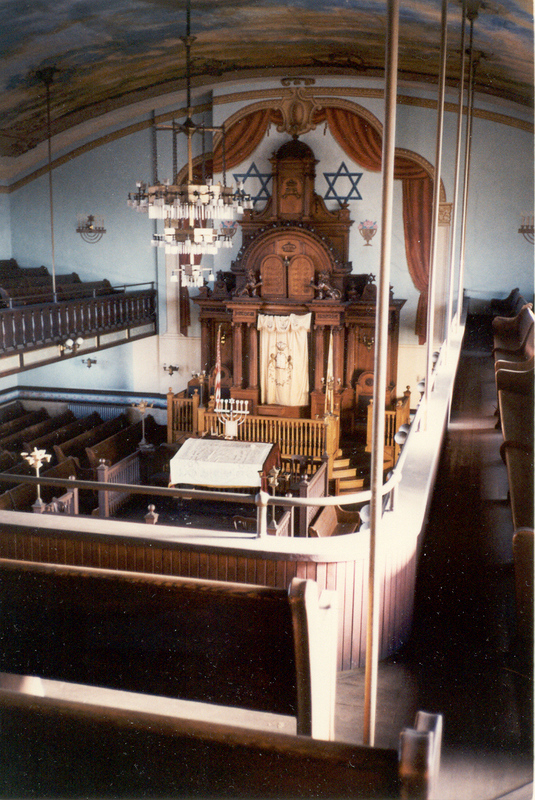 In 1986 members of Ohavi Zedek Synagogue’s archives committee were given access to take archival images of the mural prior to its being covered. These images will form the basis of the restoration effort. 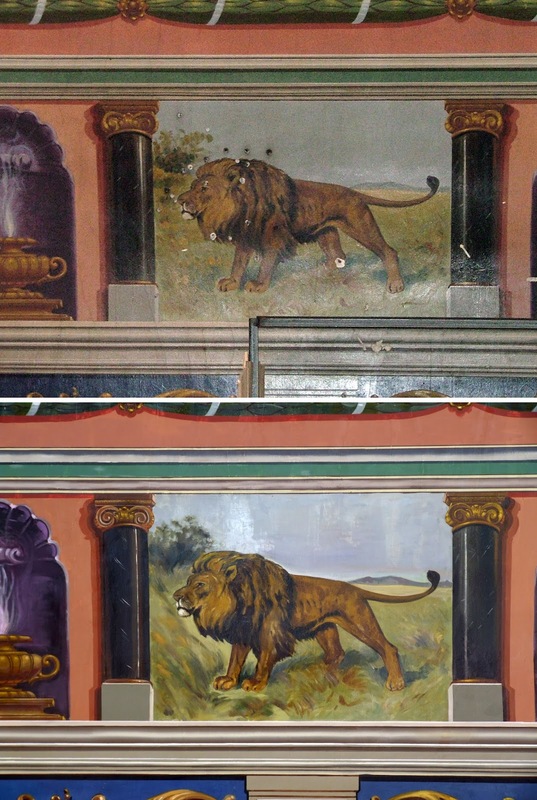 When the mural is stabilized and extracted it will be restored to match these images. The mural is flaking badly. The intent is to consolidate the original plaster and pigments and to avoid over-painting. The work must be cleaned, a very delicate operation, and then the empty spaces must be infilled by a skilled conservator. The congregation has stated that " We feel that it is our responsibility to protect and restore this artwork on behalf of the Jewish people and for the generations to come." Ohavi Zedek is taking this work very seriously and using the best conservation methods. A summary of the conservation/restoration plan can be read here. Similar motifs appear in carved Torah arks and in paper cut decorations and other synagogue art, many examples of which were exhibited in the Gilded Lions and Jeweled Horses, From the Synagogue to the Carousel, curated at the American Folk Art Museum in 2007 by Prof. Zimiles. Indeed, a carved example can also be seen in Burlington, at the Ahavath Gerim synagogue built in 1908. Burlington, Vermont. Congregation Ahavath Gerim. 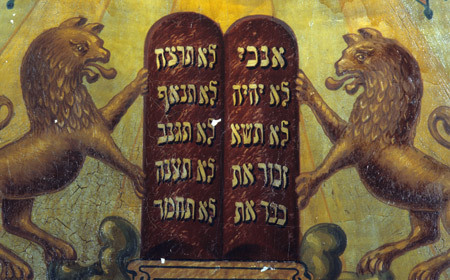 Note carved lions a Decalogue above the ark. Photo: courtesy Julian Priesler. 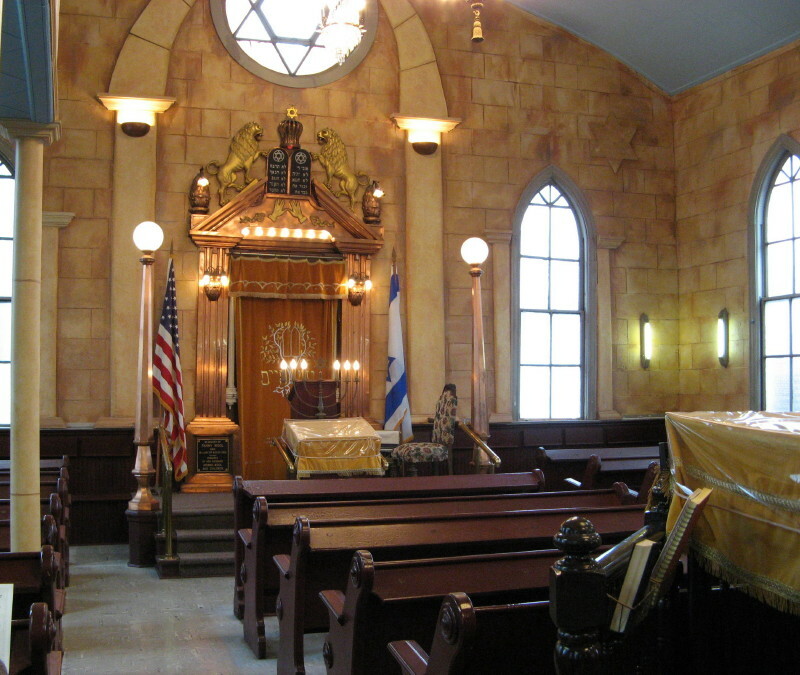 Related paintings include the near contemporary Zodiac signs (mazoles) at the Stanton Street Shul in New York (1910), also the object of a conservation program, and the painted curtains above the elaborate art at Congegation Agudas Sholom in Chelsea (Boston), Massachusetts (1909). On painted curtains, see my earlier post about the restoration of the Kupa Synagogue in Krakow, Poland. Another example is the excellent mural painting cycle in Knesset Israel Toronto (1911) which has been fully restored in situ and can be seen to good advantage in Louis Davidson's photography here. Chelsea (Boston), MA. Congregation Agudas Sholom (1908). Photo: Samuel D. Gruber, 1990. New York, NY. Stanton Street Shul sanctuary showing wall paintings of mazoles in need of restoration. Photo: Samuel Gruber 2012. A very small number of murals in this style - but mostly in fragmentary condition -have been rediscovered in former Jewish prayer halls in Poland and Ukraine. 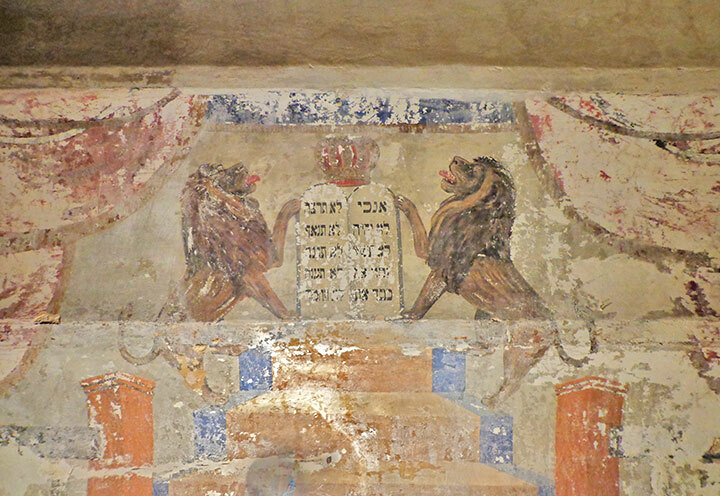 Recently, for example, a mural of lions flanking a crowned Decalogue was uncovered in a former prayer room in a basement in L'viv, Ukraine, and murals with scenes from Holy Land were recently revealed in the Groisse Shil in Cherivtsi, Ukraine. Fragments of other paintings that once adorned the Ark walls of synagogues have also been found, often under layers of whitewash, in several other places in Eastern Europe, but these are generally fragmentary and in poor condition. L'viv, Ukraine. Wall painting fragment from basement prayer room. L'viv, Ukraine. Tsori Gilod Synagogue. Detail of Ark wall before renovations. Photo: Samuel D. Gruber, 2002. Also in L'viv is the exceptional Tsori Gilod synagogue which until about a decade ago preserved intact its entire 1920s painted decoration. Unfortunately, instead of conserving that vividly colored and iconographically rich decoration by consolidating the plaster and maintained as much of the original paint as possible, many of the paintings were "refreshed" by massive over painting which maintained the general themes of the original, but also destroyed much of the original design and artistry, and compromised what had been the only intact painted interwar synagogue interior. In a place like L'viv this loss is especially great since the painted walls were not only religious and artistic creations, but also should have been seen as Holocaust survivors, and surrogates for so much art that was destroyed. Each of these are original works drawing from a rich Eastern European Jewish iconographic tradition that symbolized the behaviors, expectations and aspirations of traditional (Orthodox) synagogue builders and congregations. Some elements can be found in ancient and medieval Jewish contexts (sun's rays, zodiac signs, Decalogue), others are more recent and freer combinations and interpretations (modern musical instruments, scenes from the Holy Land). The handful of surviving synagogue paintings of this type in America and in Europe is but a tiny fraction of what was destroyed in the Holocaust. Most of these paintings, and especially those found in small prayer halls in every town and city, were never photographed and rarely described, and will never be known. We must piece together the history of what was once a large and creative artistic and religious practice from scattered fragments. Congregation members in Burlington do not have quite that heavy an historical burden and responsibility, but still they have been entrusted with a unique survivor of the Age of Immigration. The mural is a gift from the past that adds color, vitality and the immediacy of piety to, what we are usually forced to recall only through occasional black and white and often blurry photographs. As I have written before, there are few photos at all of the interiors of small immigrant synagogues, so for the most part, except on New York's Lower East Side, their existence has been mostly forgotten. For more related to this subject, read my paper "Polish Influence on American Synagogue Architecture".